This page has moved, click here to be redirected. 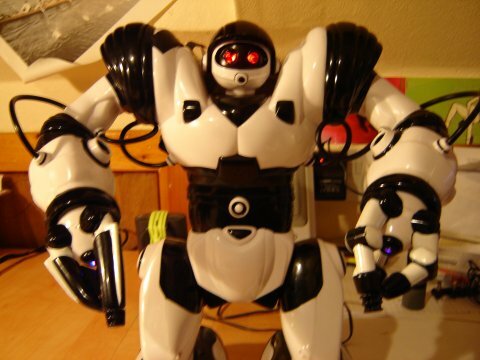 I have taken a look under RoboSapien's skin to see how this robotic toy works. The following is simply the photos which I took, I'll add more detail soon. The quality of some of these pictures is very poor and I will try and takes better ones to replace these, as and when I can be bothered and have the time. Scroll down to the bottom of the page to see photos of the underside of the control board where connection to all the sensors / motors are available. 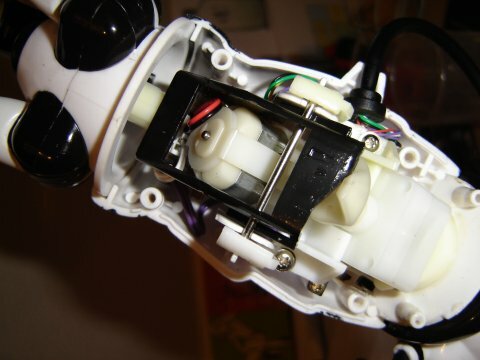 New photos at the bottom of the page, these are of robosapien's forearm and hand. 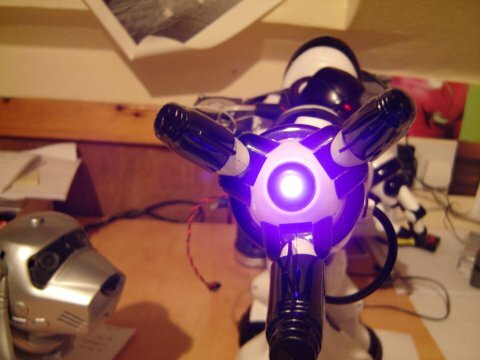 Shows how it would be possible to replace the LEDs in his hands. Robosapien prepares to be torn appart in the name of science. Four screws from the back and his chest and back will come off, careful with the back as the cable for the power switch and speaker needs to be unplugged from the PCB. 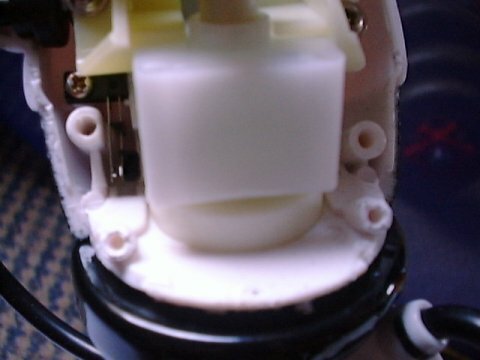 The back plate, showing the cable running to the switch and speaker. *Bad photo* of Robosapiens main control board within his back. 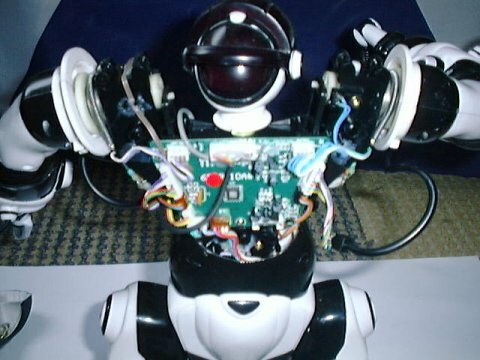 Note the two motors in the shoulders. Underneath that chest there's not a lot (potential for adding your own hack). You can see in the centre his microphone used for detecting 'sharp' noises such as tapping on his body or clapping. 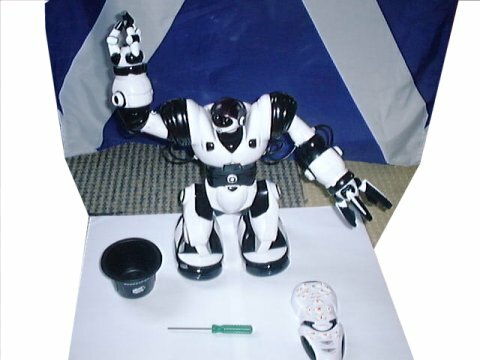 Within Robosapien's forearm is the motor which controls his elbow movement and also opens his hand when the elbow is fully rotated. The black piece at the front of the picture actuates the hand when it is pushed by the cam on the right hand side of the image. From the bottom feeds the black cable which feeds power to the motor and carries the data from the button on the end of his finger and also a limit switch located just out of sight in this picture. 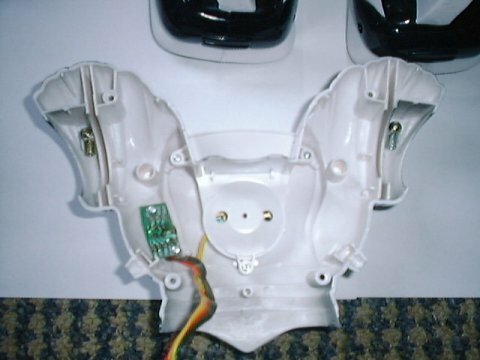 Three screws hold the lower torso bodywork on, the top two are covered with small caps but these are easily removed. 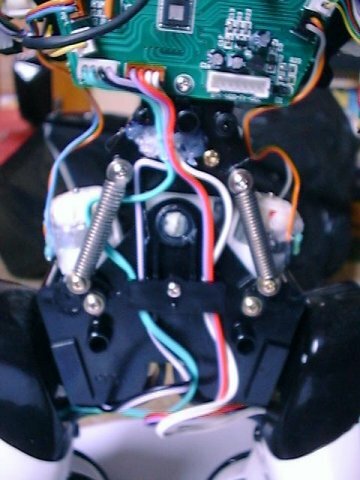 The two motors that control Robosapien's legs are clearly visable in this image. Also in there somewhere is the seventh motor which controls the sideways sway of robosapien which allows him to walk. 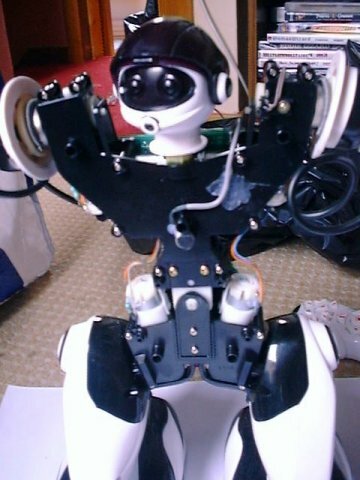 Robosapien from the front without any of his torso bodywork. Taking the two side panels of his right foot you can see the two-bar link which keeps Robosapien's feet parallel to the floor whether his foot is infront or behind his body. 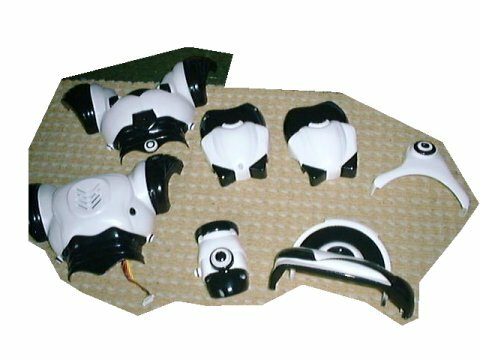 The various bodyparts taken off. A word of caution, the forearms are actually glued together and some force may be required to seperate the two halfs. I noticed that two locating pins were snapped off while I tried to open it. 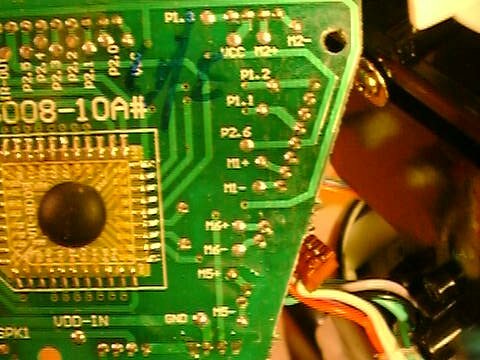 Better photo of the underside of robosapien's control board. 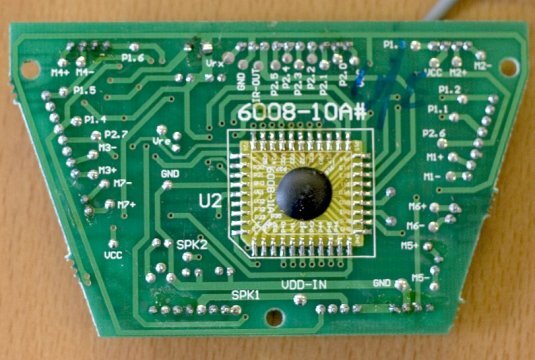 Points to note are the solder pads designed to give us hackers easy access. 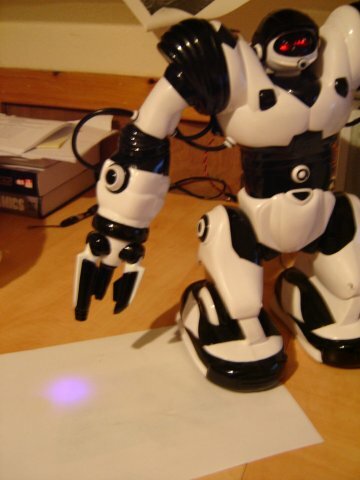 On the other robosapien page of this website you can find a description of what each pad controls / is connected to. Took a while for me to get a decent picture, as I haven't set up the tripod and don't know the focal distance at which the macro setting on my camera is. 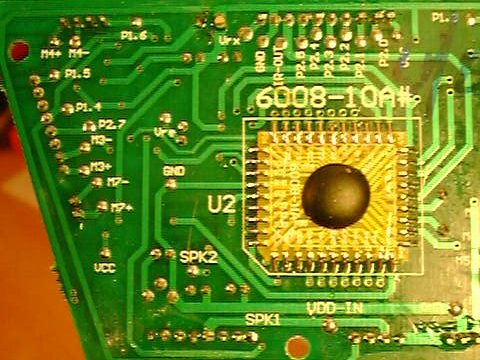 Anyway, this is the underside of the Robosapien control board, as you can see there are solder points designed for us hackers to tap into an i/o line. We can see along the left of the photo the points for right arm and leg. At the bottom left of this picture is the connection to the speaker and the on/off switch. 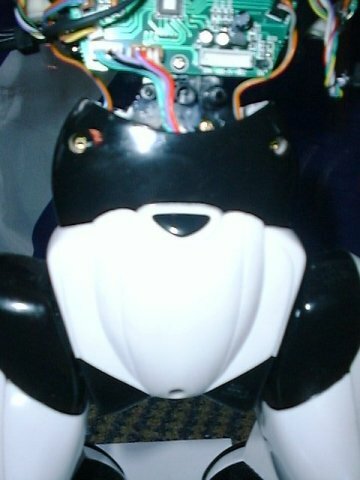 At the top left we see the right shoulder and along the top centre we see the head connection with the LEDs for the eyes and the IR receiver. 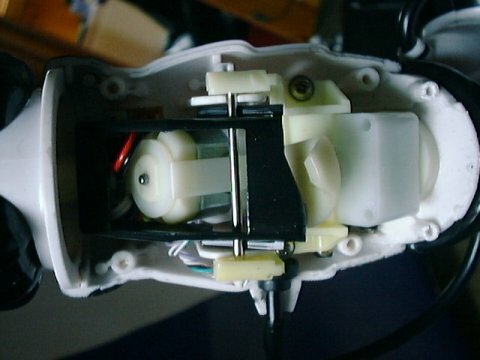 The "left" half of the control board underside (this connects to the left arm, leg and to the batteries). 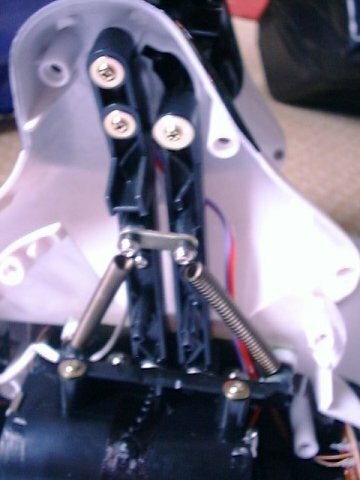 This is robosapien's left forearm opened (although thats his right hand, as I have swapped them). Another view of his forearm. 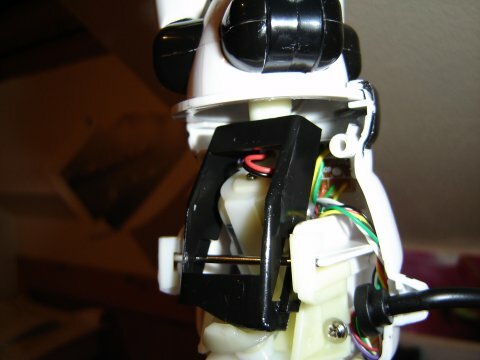 This frees the "actuator" (the black plastic rectangular piece). You can now remove the hand, be careful when disconnecting the wires that you don't take the socket with the plug (which it tried to do in my case). 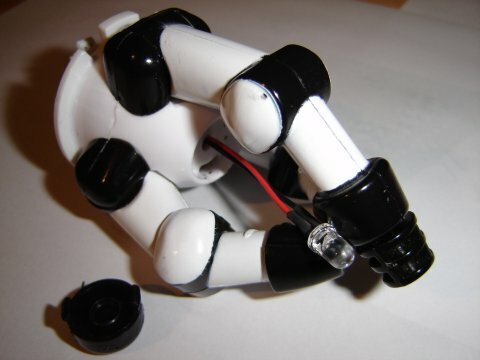 The "grip" of robosapien's hands are therefore dependent on the spring and not the motor, however if you added a stronger spring (with the intention of increasing the grip) the elbow motor will need to work harder in order to open the hand. 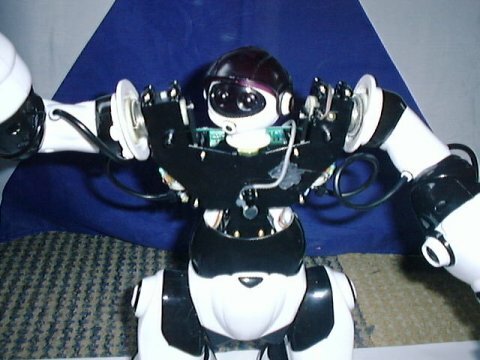 As the elbow motor serves two functions it is likely that this would mean that robosapien may not be able to fully extend his arm (and subsequently open his hand). With the hand removed (I wouldn't reccomend trying this with the hand still attached although it may be possible) you can persuade the black cover off (which holds the LED). It would be possible to replace the LED for one of a different colour, e.g. blue or red. It would be a good idea to try a hyper-bright LED, pity I didn't have any when I took the photos. 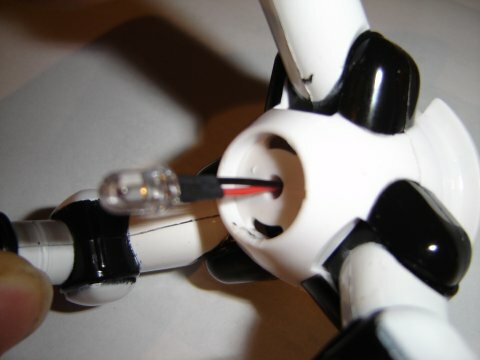 Don't forget the polarity of the LED (which leg runs to the black lead and which to the red)! I removed the current LEDs and replaced it with Violet LEDs. Violet was chosen as Maplin didn't have any Hyper blue, blue, hyper ultra-violet, ultra-violet or hyper violet LEDs in stock (my choice in order of preference), talk about narrowing down the choice a little! Although this isn't a "super-bright" or "hyper-bright" LED the output is pretty reasonable, as demonstrated by shining it on the paper. Both hands with Violet LEDs. Simple but good mod I'd say. Tempted to do the same with the eyes although not sure about colour.